Players of Leicester City will be rewarded with Mercedes cars worth £32,670 each after they beat the odds to win the 2015/2016 premier league title. Leicester City football Club chairman Vichai Srivaddhanaprabha will reward his underdog heroes with their own Mercedes B-Class Electric Drive for winning the premier league despite being tipped for relegation at the beginning of the season. According to the Daily Mail, each player will receive his own car valued at £32,670 which will cost Thai Billionaire Vichai Srivaddhanaprabha about £1 million. 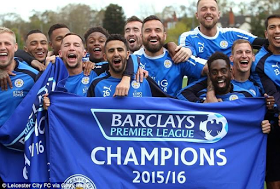 The players will also share £6.5m among themselves as title winners according to Premier League rules. Vichai Srivaddhanaprabha, who is worth £2billion has also provided free beer for fans at the King Power Stadium during match days this season and is also looking at other ways to reward his team.